Chef’s Tasting Menu – Victory 44 | Eat.Drink.Life.Love. When a friend contacts you out of the blue and asks if you’re free on a random Tuesday night to do the chef’s tasting menu at Victory 44 in Minneapolis, the answer is ALWAYS yes. The friend? The thoughtful, brilliant and ebullient Emily Anderson (aka The Broccoli Stalker). The chef? The stunningly creative Erick Harcey of Victory 44 and Parka. The occasion? Every Tuesday evening, you can go into the warmly comfortable V44 and leave your dinner fate up to the imagination of Chef Harcey. Your journey will cost you a mere $25 (unless you add wine and, even if you do, there’s a great vinho verde for about $5 a glass), but the five courses that show up in front of you are priceless. 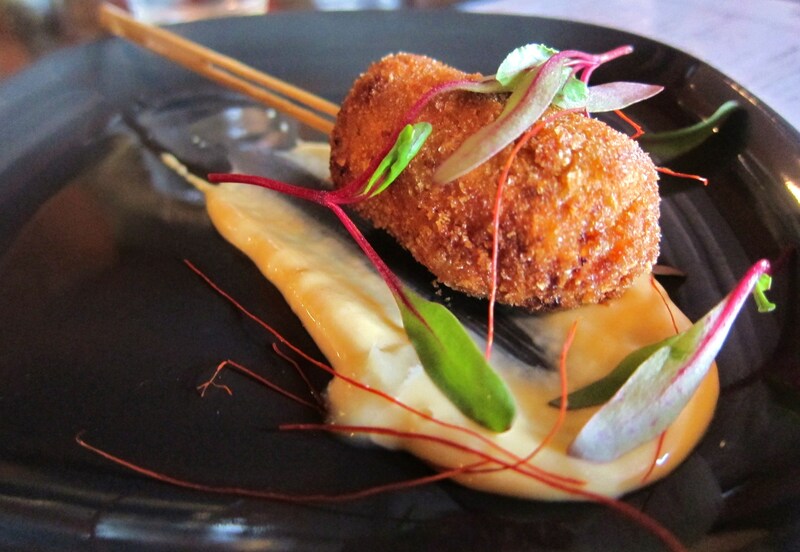 A duck “lollipop” with miso mayonnaise. It was hot and crisp and savory and salty and perfectly meaty. I’ll take this over a Tootsie Roll pop every single day. 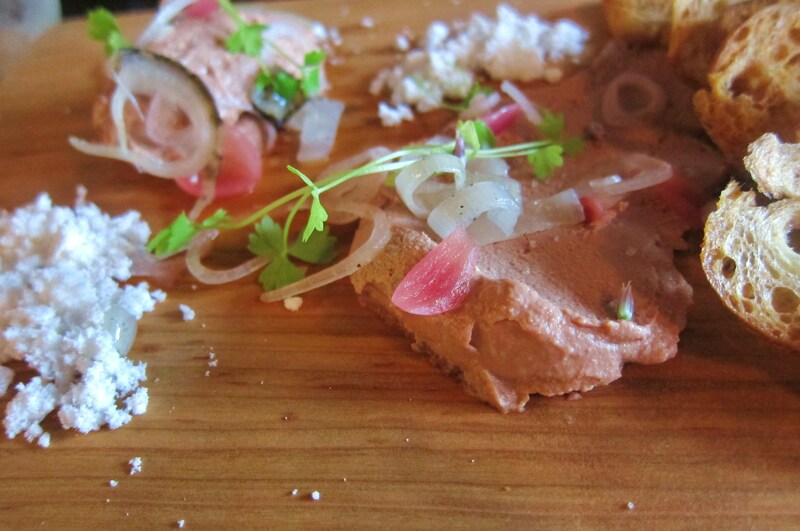 A smooth, creamy chicken liver pate to spread on little garlicky toasts with pickled onions. To me, chicken liver pate is either very good or very bad (tinny, grainy, etc.) This pate was very, very good. 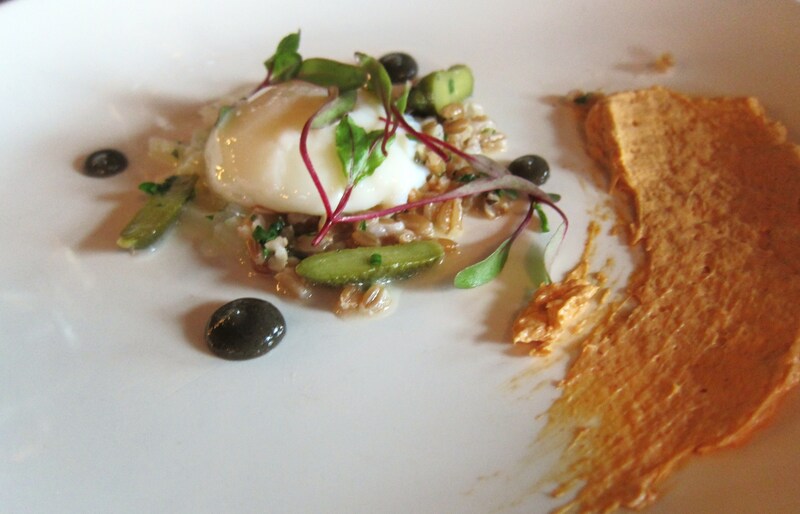 A 62 degree egg over farro with chorizo “paint.” The farro was perfectly chewy and while the egg was a little too runny for my taste, it blended beautifully with the spicy chorizo sauce and the piquant cornichon pickles. 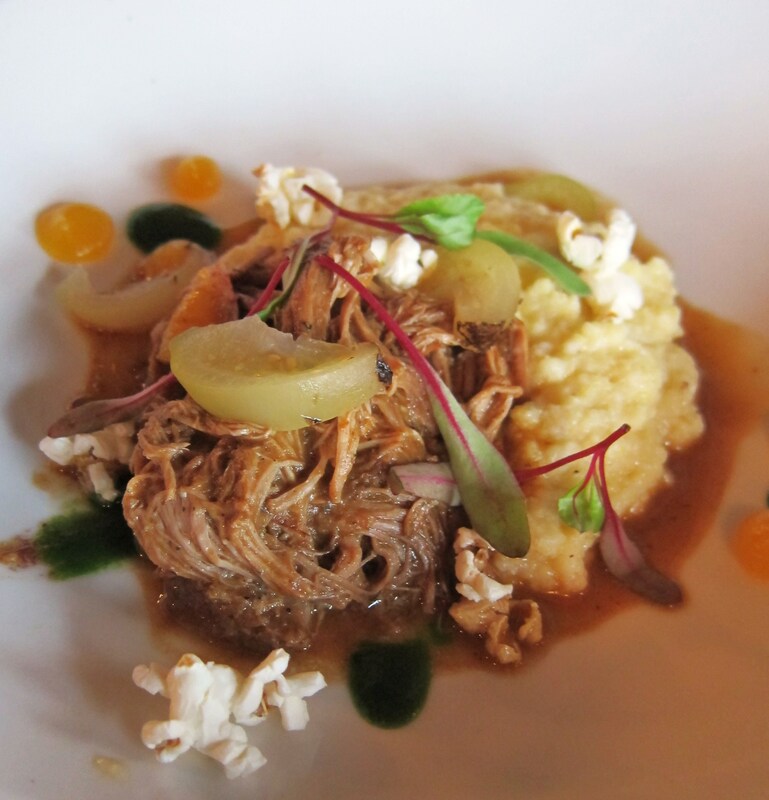 This course was, hands down, our favorite — fall-apart tender pulled pork over popcorn grits with tart little tomatillo pickles. Hit every perfect food note. And for dessert we relished a cheese course with white cheddar, pretzel flatbread, fruit chutney and sweet and spicy nuts. Sorry I didn’t get a picture, we were too engrossed in conversation and savoring our meal and I forgot. I just gave you five exquisite, enticing reasons to get to Victory 44 on Tuesday night and experience the best $25 you’ve ever spent. So…what are you waiting for?!? GO! Such a great food night! Let’s do it again. Also, if all grits were popcorn grits studded with popcorn, you wouldn’t hear an argument from me.